When this Bristol based Indian restaurant called us to get their carpets and upholstery cleaned, they set us quite a challenge (as you could see from the photos). The carpets and upholstery were very dirty – having been exposed to many types of dirt and grease, including of course Indian food! We initially presprayed the seating areas in conjunction with terry towels to agitate the material – which allowed us to minimise the soaking of the upholstery material. To complete the process, we rinsed though and dried the seating areas. 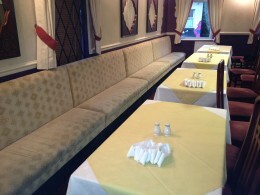 The restaurant owners thought their carpets and upholstery looked as good as new!